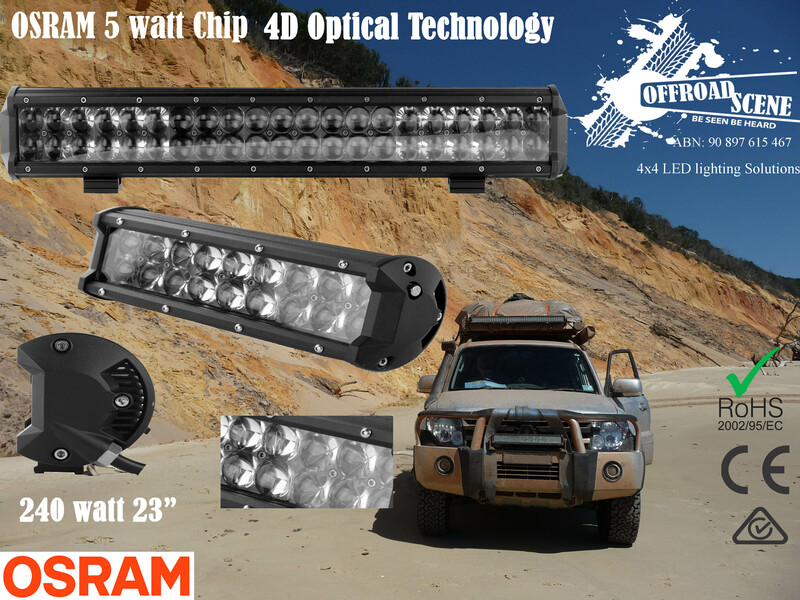 240 Watt LED Light Bar, equipped with OSRAM 5 watt chips from Germany, matched to the latest in 4D optic lens technology. 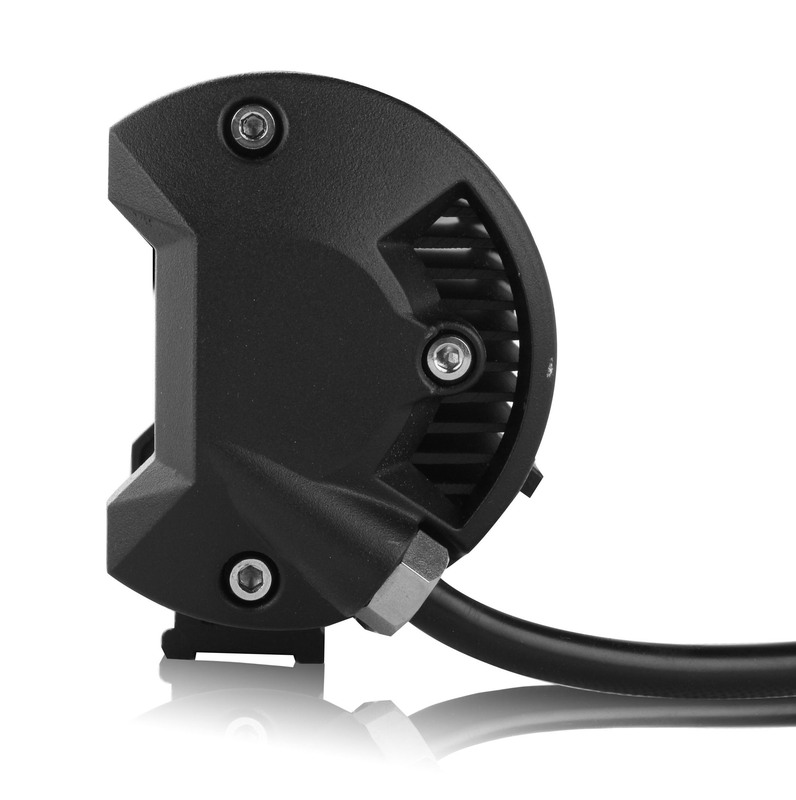 All contained within a 23" housing making it physically the same size as a traditional 120 watt bar but with superior output to a traditional 240 watt light bar. Offroad Scene: - New to Swapmeet, but with the same friendly service as delivered through our established online store. 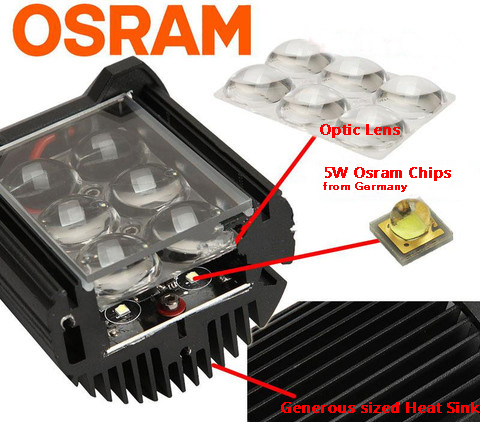 After extensive testing we are proud to offer our newest 5 watt OSRAM Chip LED light bar matched to the latest in 4D Optic lens technology. The new optic lens allows for a much more projected and concentrated pattern and this 240 watt version at 22.5” is physically the same size as a traditional 120 watt light bar but with superior light output to a traditional 240 watt bar. Be the envy of all your mates with this latest bit of awesome technology. Who Are We? – A family owned and operated business by people with a passion for the outdoors. We offer quality items at affordable prices, AND we personally test, each model in the great outdoors, for suitability and reliability before placing it for sale. Why buy from us? Sure! We are not the cheapest, with online auction sites offering a selection of lights cheaper than what we do. But! are they tested for durability and longevity by the people selling them? And most importantly do they comply with Australian regulations? All our products are RCM (previously C-Tick) compliant and carry the Australian RCM logo, along with being CE and RoHS compliant, and through our strong relationship direct with the manufacturers we also have the support and backing for all the products we sell. Offroad Scene continue to grow our product range and customer base so please continue to visit our web site for updated product ranges. Warranty: The replacement warranty on all of our products applies to faults from the manufacturer and does not cover misuse or general wear and tear. All faulty items must be posted back to us at the customer’s expense. The faulty product will be checked by us, once determined that it is a manufacturers fault, then a brand new equivalent product will be sent out at our expense. Returns policy: We are not required to provide a refund or replacement if you change your mind, ordered the wrong item, found the goods cheaper elsewhere, were aware of the relevant fault before buying the goods, damaged the goods by misusing them, including inappropriate mounting and wiring. But you can choose a refund or exchange if an item has a major problem. This is when the item: Has a problem that would have stopped someone from buying the item if they had known about it Is unsafe Is significantly different from the sample or description Doesn’t do what we said it would, or what you asked for and can’t be easily fixed. Alternatively, you can choose to keep the item and we will compensate you for any drop in value. If the problem is not major, we will repair the item within a reasonable time. If it is not repaired in a reasonable time you can choose a refund or replacement providing you have proof of purchase in the form of a tax invoice. In order to process return of products for repair, replacement or credit, please be sure to include the following information: Copy of the original invoice The reason for the return Your daytime phone number The Australian Consumer Law provides you with statutory rights and "consumer guarantees". This Returns Policy is in addition to your rights and remedies under the "consumer guarantees". You must present proof of purchase to Offroad Scene when returning a product. Refunds (if any) may be issued in the same form of tender as the original purchase transaction (cash, credit card, EFT, PayPal) and it's the customers’ responsibility to produce proof of purchase. Offroad Scene reserves the right to access the condition and age of the returned goods prior to providing a remedy: and/or refer the item to the manufacturer of the goods for assessment to determine whether or not you are entitled to a remedy. Unless we have supplied incorrect goods, all return postage/shipping costs are the responsibility of the purchaser. Once Offroad Scene has the goods, we will assess the fault and provide an appropriate remedy. If the goods have a fault, Offrroad Scene will provide compensation for your return postage by Australia Post with tracking or registered Post.